I am currently in the San José State University iSchool MLIS program to earn my master’s in library and information sciences. I hope in the future to work in an academic library and help students and professors with their research. This all started with the Arnhold Undergraduate Research Fellows Program. From there, this wild roller coaster has taken me on an amazing ride. Originally my research was just about the ballad, but as I learned more about the background, I found the history itself fascinating. I had learned in a previous class that the ballad was also a broadside ballad. After much research, I realized it was the text’s life as a broadside ballad that allowed it to inspire such a historical following and spread to such a wide audience. It is the broadside ballad, the song and the tune, that persists to inspire us today. 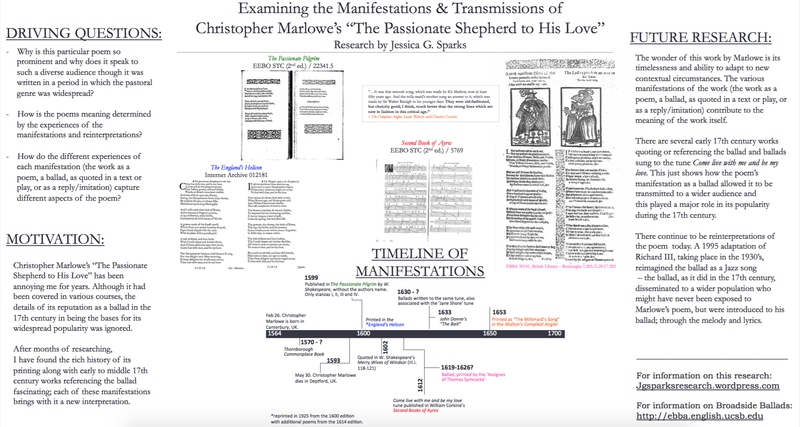 My hope is that this site will be a space which encourages further research of Christopher Marlowe’s ballad in a way that makes it an interactive experience. This project will help us reimagine how we view and research these kinds of works using the technology available so that what we learn can be disseminated to an audience of our peers and students, and they too can participate in the research-learning experience. Dr. Patricia Fumerton, Jessica Sparks, and Dr. James Kearney. This project wouldn’t have been possible without the support of the Arnhold Undergraduate Research Fellows Program, the English Broadside Ballad Archive (EBBA) at UCSB, and my mentors: Dr. Patrica Fumerton and Dr. James Kearney. Fun Fact: The total word count of this site is over 16,501! That’s about 33 single-spaced pages or 66 double-spaced pages.